As I said, when I was in London I had the magnificent opportunity to be centimetres away from fabulous 1950's couture. As I also said, it's quite painful not being able to show you my photos. But I can at least share my thoughts and direct you to the V&A online collection! First off is a suit, made by Charles Creed in 1954. I selected this suit because I really wanted to see some nice 1950's tailoring and a classic suit for ladies who luncheon. And this really was the perfect example! It's a very strict yet very feminine suit in dark blue fine wool. I would wear it in a heartbeat if I had the chance, but since it's A in a museum and I wasn't even allowed to touch it and B it's made for someone a lot smaller than me, that's not gonna happen. Yes, the suit is tiny. I estimated the waist on the skirt to about 60 cm. Charles Creed was born into the world of fashion, the tailoring house of Henry Creed & Company in Paris (although the family was British) with roots going back to the 1700s and having both the French and British courts as clients. Creed was educated in Paris and Vienna, but when Paris was taken by the Germans in 1940 he went to London and started working for Fortnum & Mason, before opening his own label in 1946. After closing his couture salon in 1966, he donated some garments to the V&A, among them this suit. Creed was a specialist in tailoring, and was influenced by military uniforms. And now on to details about the suit for us sewing and vintage nerds: The jacket is fitted, has a small collar, a single row of buttons (and hand sewn button holes) and wonderfully accentuated hips - both from the cut and from the pocket flaps. 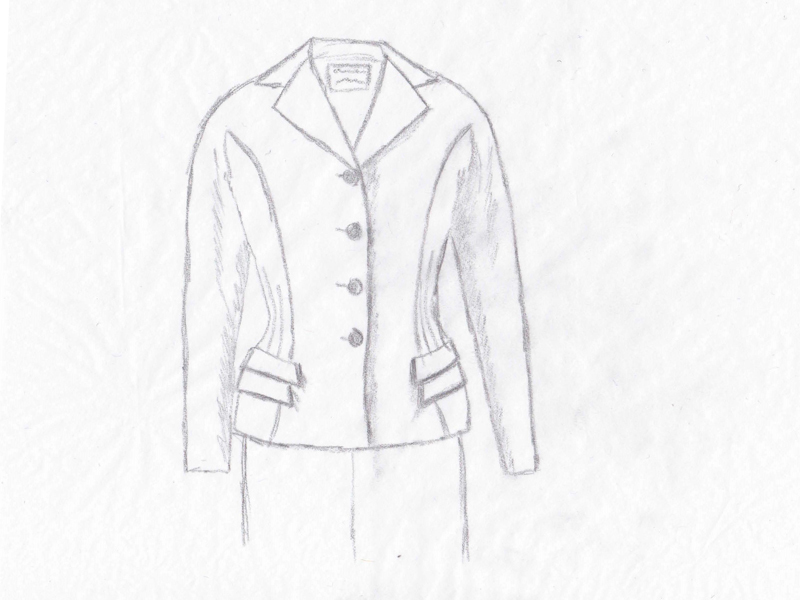 The jacket is lined with dark blue silk - crêpe de chine according to V&A - while the skirt is unlined. The shoulders are very rounded (so much more Christian Dior New Look than wartime square shoulders!) and the sleeves are cut in one with the bodice. The bodice has a front piece and a side piece with two darts, ending in the pocket. There's a centre back seam and back side piece; without darts but tapered from the waist. I couldn't see what happened between the wool and silk, but there must be some hair canvas giving the hips the perfect shape. The skirt is a simple pencil skirt with seams centre front and back and at the sides. Each piece has a dart. There's a white petersham waist band and some hooks, eyes and snap fasteners under a placket - no zipper. All the seams are hand over-cast and the darts are opened and hand-overcast (which is really interesting since the wool really isn't fraying. At all). One of the most elegant details in the suit is rather hard to see from the photos, but very evident in person. A thin black braid is inserted in the skirt's side seams and the arm seam (that's on the outside of the arm) from the collar to the cuff. (Note that it's inserted in the seams, not sewn on afterwards! Oh the work to do this!) The braid is most noticeable on the pocket flaps - very neat.